Different red and attractive pink shades are the hues which are evergreen of the bridals. But, this year green and white color based shades are added and contemporized brides will be a twinkle in this various tones along with golden work. 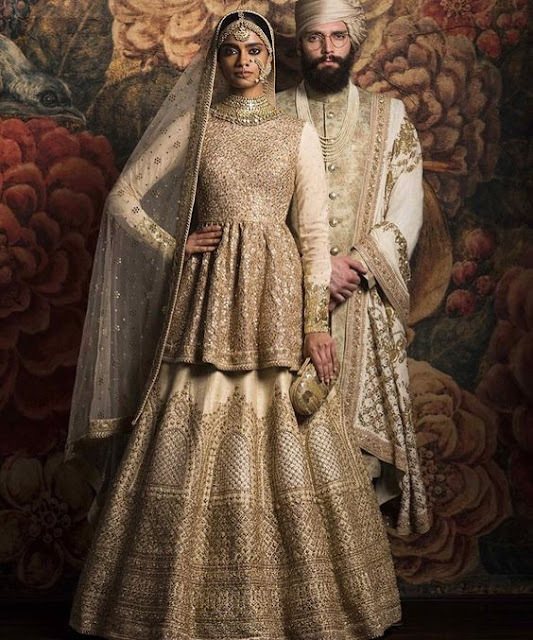 Old fashion has been gone when bride and groom are not focused more on matching wedding outfits but they select either blending or contrasting shades for their special day. It is quite difficult to search out best wedding dress as it requires numerous factors to be considered especially price. 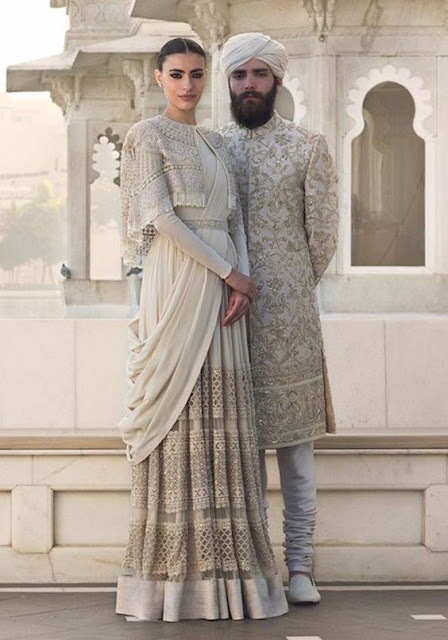 To look gorgeous on your special day, wisely select the latest color of wedding outfits that match up with groom’s turban or dupatta. You may opt unique textures that have elegant work to have a feminine appearance. Prepare yourself with proper research related to shades, patterns, etc. before approaching. It’s time to try out unique hues if you are the lovely bride of 2019, you can go through below amazing color combinations of wedding dresses. By keeping the chaos of bride and groom wedding dress selection process, some variety of sophisticated wedding collections details have been given in this article that helps you out pick up quickly unconventional shades. Green contains the effective energy of nature and it is a shade of richness and new life. 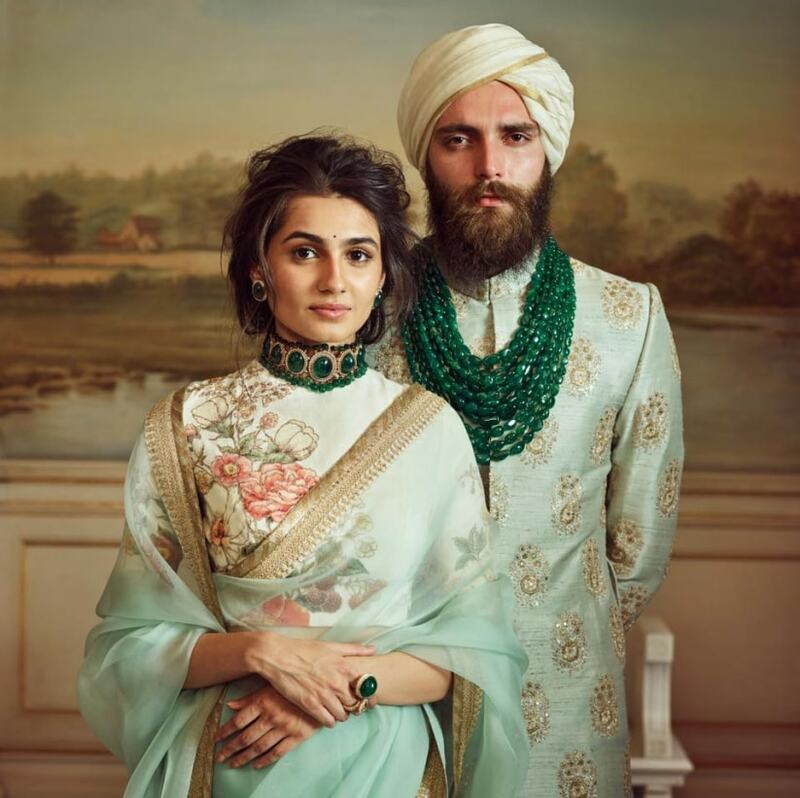 Sabyasachi Mukherjee’s collections are always fascinated that everyone stops to look out as he introduces his innovations along with sinuous embroidery and zardozi work. This pistachio green color brocade heavy lehenga is encrusted with crystals & rhinestones, pearls, zardosi border and work over all the lehenga. Wear this lehenga with the heavy necklace, Ear-ring, ring, mathapatti, and bangles to add the grace to your appearance. Drape the sheer dupatta from back to front and wrap it on the arm for an elegant look. Heavy embellished broad border worked with silk – floss thread, precious stones, and beaten gold bullion are really appealing. You can wear in functions like Wedding, reception, etc. 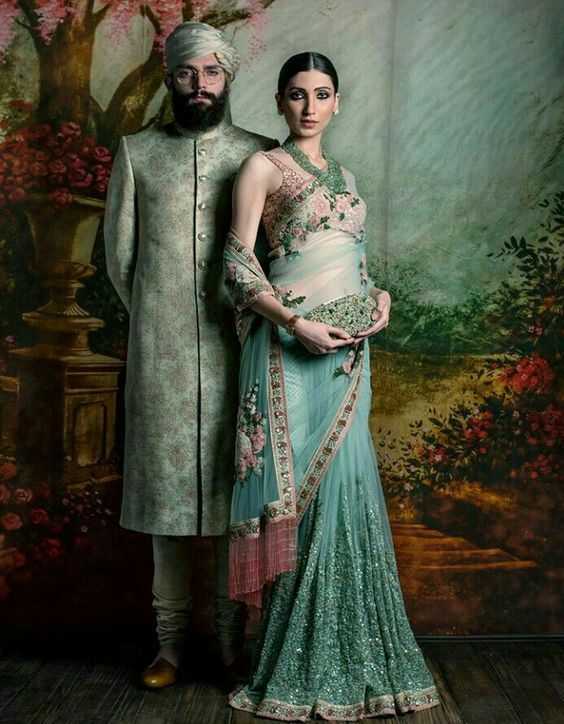 Wear this moss green heavy embroidery worked lehenga with worked sheer dupatta and pair with your groom’s sherwani or turban color. The designer always comes up with innovations and this lehenga is best for those who want to do an experiment. Heavy golden worked long sleeve blouse is absolutely marvelous. Golden worked heavy lehenga with statement dupatta is outstanding. Pairing with golden or dull shade jewelry gives gorgeous look. Moreover, Golden Sherwani with off-white worked dupatta & golden turbine gives an elegant look. If you are looking for bridal wear saree in the dark-light shade, select this pastel sapphire blue color heavy worked saree for your wedding day. Sleeveless blouse with this saree with deep round neck will give your look charming. Slim lady can opt this due to its design and pattern. Light blue pastel color sherwani with turbine gives a sophisticated glance. Baby blue color saree looks pretty if you accessorized with the stunning diamond set. It will add the value if you pair with your groom’s sherwani – hand printed with multiple strands of emeralds. Heavy embellished off-white worked long bridal gown with heavy worked belt provides height illusion. Drape the dupatta in a different style to have a charming appearance. Those are looking for wearing fewer accessories, this gown is perfect. Golden color work in gown provides festive look. Pair up a cadmium yellow hand embroidered silk lehenga having tilla work along with a purple heritage banarasi dupatta if you are looking for brides shades. 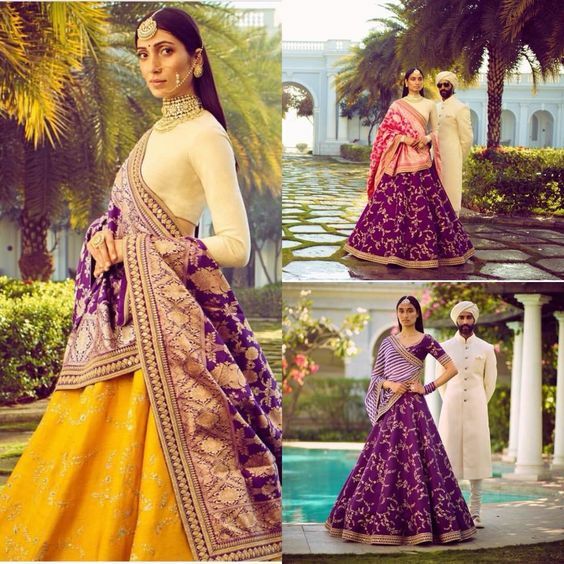 You can also pair violet lehenga with violet leriya dupatta for a rich appearance. 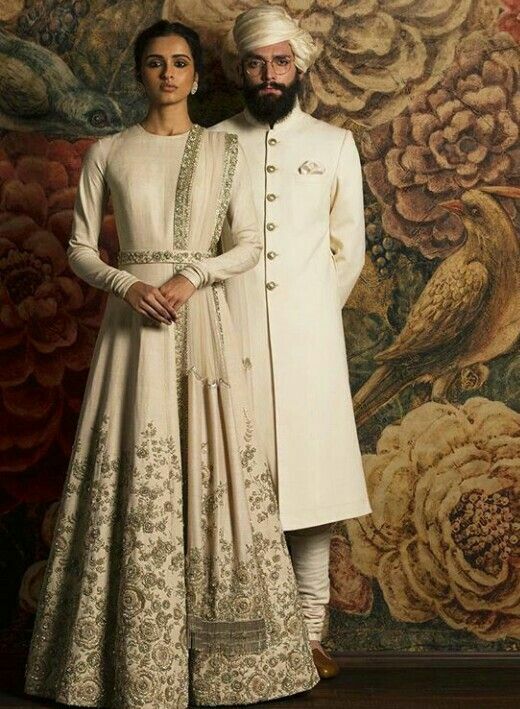 Wear this unique outfit and contrast with groom’s attire and turbine. This will look great if you select this for mehndi function. A jewel-toned embroidery work silk blouse with a sweetheart neckline and elbow length sleeves provide lavish look. Wear this lehenga with magnificent maang tikka, cocktail ring, and glass rings to complete your look. The emerald shades will take the center if you wear in cocktail function. Fashion changes from time and time and designer reinvented unique styles. 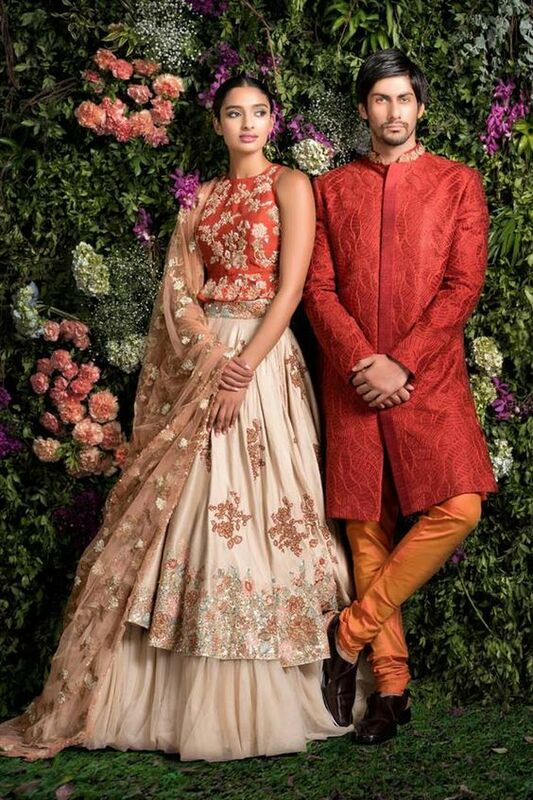 Bridal lehenga in orange & off-white embroidery lehenga is in vogue nowadays. This multilayer lehenga along with golden – silver threads are used to give bridal effect. Nothing is more exquisite than porcelain inscribed elegant saree with the worked cape in silver color. Fair women who have peach tones can wear this and match up with groom’s clothes for a radiant appearance. You can visit our Indian Ethnic Wear Website to get the latest Bridal Collections. Shop now and get a benefit of the exciting deal with Worldwide Free Shipping.